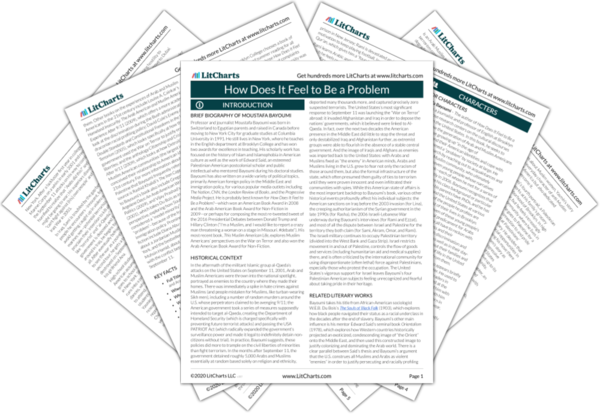 Instant downloads of all 946 LitChart PDFs (including How Does It Feel to Be a Problem). Welcome to the LitCharts study guide on Moustafa Bayoumi's How Does It Feel to Be a Problem. Created by the original team behind SparkNotes, LitCharts are the world's best literature guides. A concise biography of Moustafa Bayoumi plus historical and literary context for How Does It Feel to Be a Problem. A quick-reference summary: How Does It Feel to Be a Problem on a single page. In-depth summary and analysis of every Chapter of How Does It Feel to Be a Problem. Visual theme-tracking, too. 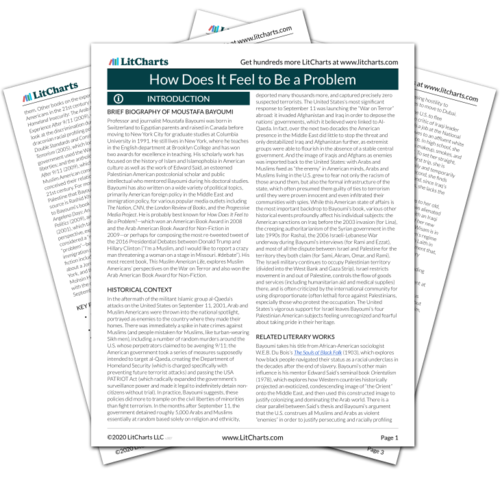 Explanations, analysis, and visualizations of How Does It Feel to Be a Problem's themes. How Does It Feel to Be a Problem's important quotes, sortable by theme, character, or Chapter. Description, analysis, and timelines for How Does It Feel to Be a Problem's characters. Description, analysis, and timelines for How Does It Feel to Be a Problem's terms. Explanations of How Does It Feel to Be a Problem's symbols, and tracking of where they appear. An interactive data visualization of How Does It Feel to Be a Problem's plot and themes. Professor and journalist Moustafa Bayoumi was born in Switzerland to Egyptian parents and raised in Canada before moving to New York City for graduate studies at Columbia University in 1991. He still lives in New York, where he teaches in the English department at Brooklyn College and has won two awards for excellence in teaching. His scholarly work has focused on the history of Islam and Islamophobia in American culture as well as the work of Edward Said, an esteemed Palestinian American postcolonial scholar and public intellectual who mentored Bayoumi during his doctoral studies. Bayoumi has also written on a wide variety of political topics, primarily American foreign policy in the Middle East and immigration policy, for various popular media outlets including The Nation, CNN, the London Review of Books, and the Progressive Media Project. He is probably best known for How Does It Feel to Be a Problem?—which won an American Book Award in 2008 and the Arab American Book Award for Non-Fiction in 2009—or perhaps for composing the most re-tweeted tweet of the 2016 Presidential Debates between Donald Trump and Hillary Clinton (“I'm a Muslim, and I would like to report a crazy man threatening a woman on a stage in Missouri. #debate”). His most recent book, This Muslim American Life, explores Muslim Americans’ perspectives on the War on Terror and also won the Arab American Book Award for Non-Fiction. 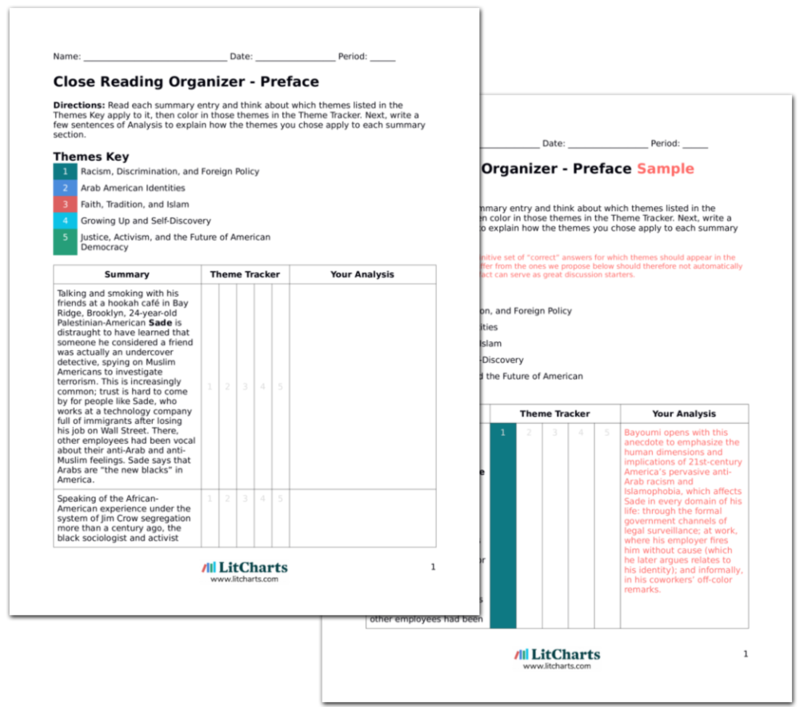 Get the entire How Does It Feel to Be a Problem LitChart as a printable PDF. In the aftermath of the militant Islamic group al-Qaeda’s attacks on the United States on September 11, 2001, Arab and Muslim Americans were thrown into the national spotlight, portrayed as enemies to the country where they made their homes. There was immediately a spike in hate crimes against Muslims (and people mistaken for Muslims, like turban-wearing Sikh men), including a number of random murders around the U.S. whose perpetrators claimed to be avenging 9/11; the American government took a series of measures supposedly intended to target al-Qaeda, creating the Department of Homeland Security (which is charged specifically with preventing future terrorist attacks) and passing the USA PATRIOT Act (which radically expanded the government’s surveillance power and made it legal to indefinitely detain non-citizens without trial). In practice, Bayoumi suggests, these policies did more to trample on the civil liberties of minorities than fight terrorism. In the months after September 11, the government detained roughly 5,000 Arabs and Muslims essentially at random based solely on religion and ethnicity, deported many thousands more, and captured precisely zero suspected terrorists. The United States’s most significant response to September 11 was launching the “War on Terror” abroad: it invaded Afghanistan and Iraq in order to depose the nations’ governments, which it believed were linked to Al-Qaeda. In fact, over the next two decades the American presence in the Middle East did little to stop the threat and only destabilized Iraq and Afghanistan further, as extremist groups were able to flourish in the absence of a stable central government. And the image of Iraqis and Afghans as enemies was imported back to the United States: with Arabs and Muslims fixed as “the enemy” in American minds, Arabs and Muslims living in the U.S. grew to fear not only the racism of those around them, but also the formal infrastructure of the state, which often presumed them guilty of ties to terrorism until they were proven innocent and even infiltrated their communities with spies. While this American state of affairs is the most important backdrop to Bayoumi’s book, various other historical events profoundly affect his individual subjects: the American sanctions on Iraq before the 2003 invasion (for Lina), the creeping authoritarianism of the Syrian government in the late 1990s (for Rasha), the 2006 Israeli-Lebanese War underway during Bayoumi’s interviews (for Rami and Ezzat), and most of all the dispute between Israel and Palestine for the territory they both claim (for Sami, Akram, Omar, and Rami). The Israeli military continues to occupy Palestinian territory (divided into the West Bank and Gaza Strip). Israel restricts movement in and out of Palestine, controls the flow of goods and services (including humanitarian aid and medical supplies) there, and is often criticized by the international community for using disproportionate (often lethal) force against Palestinians, especially those who protest the occupation. The United States’s vigorous support for Israel leaves Bayoumi’s four Palestinian American subjects feeling unrecognized and fearful about taking pride in their heritage. Bayoumi takes his title from African-American sociologist W.E.B. Du Bois’s The Souls of Black Folk (1903), which explores how black people navigated their status as a racial underclass in the decades after the end of slavery. Bayoumi’s other main influence is his mentor Edward Said’s seminal book Orientalism (1978), which explores how Western countries historically projected an exoticized, condescending image of “the Orient” onto the Middle East, and then used this constructed image to justify colonizing and dominating the Arab world. There is a clear parallel between Said’s thesis and Bayoumi’s argument that the U.S. construes all Muslims and Arabs as violent “enemies” in order to justify persecuting and racially profiling them. Other books on the experiences of Arab and Muslim Americans in the 21st century include Louise A. Cainkar’s Homeland Insecurity: The Arab American and Muslim American Experience After 9/11 (2009), which offers a more academic look at the discrimination during the Bush administration’s draconian racial profiling policy; David Cole’s Enemy Aliens: Double Standards and Constitutional Freedoms in the War on Terrorism (2005), which looks specifically at how the U.S. government used the War on Terror to justify eroding civil liberties; and the anthology Citizenship and Crisis: Arab Detroit After 9/11 (2009), which looks at how Detroit’s Arab and Muslim American communities (the largest in the U.S.) conceived their relationship to American identity in the early 21st century. For more information about the occupation of Palestine that Bayoumi frequently references, an excellent source is Rashid Khalidi’s The Iron Cage (2006). Complements to Bayoumi’s book also include Gregory Orfaela’s memoir Angeleno Days: An Arab American Writer on Family, Place, and Politics (2009), and Vijay Prashad’s The Karma of Brown Folk (2001), which takes Du Bois as inspiration from an opposite perspective, exploring how South Asians have come to be considered a “model minority”—the “solution” rather than the “problem”—because of the fraught history of American immigration policy. Prominent recent works of Arab American fiction include Diana Abu-Jaber’s novel Arabian Jazz (1993), about a Jordanian Muslim family moving to rural upstate New York, and the bestseller The Reluctant Fundamentalist (2007) by Mohsin Hamid, about a Pakistani American forced to grapple with the conflict between his two nations in the aftermath of September 11. Book Battle. Every year, Brooklyn College chooses a book of memoirs set in New York as required summer reading for all incoming first-year students. In 2010, it chose How Does It Feel to Be a Problem? and quickly received a number of complaints from right-wing commentators who believed the university was trying to indoctrinate students into what they described as Bayoumi’s “radical pro-Palestine” views and hatred for the American government. This eventually ballooned into a media firestorm as various outlets picked up the story. The author responded with an op-ed in which he argued that this reactionary attitude from people who clearly had not read his book was all the more proof that Americans needed the nuanced perspectives on Arab American life he offered in it, and that many Americans remain eager to conflate any mention of Arab or Muslim people with terrorism and violence. Jennings, Rohan. "How Does It Feel to Be a Problem." LitCharts. LitCharts LLC, 6 Dec 2018. Web. 11 Dec 2018. Jennings, Rohan. "How Does It Feel to Be a Problem." LitCharts LLC, December 6, 2018. Retrieved December 11, 2018. https://www.litcharts.com/lit/how-does-it-feel-to-be-a-problem.